This chapter brings digital humanities research into the domain of logistical industries. The primary task of the global logistics industry is to manage the movement of people and things in the interests of communication, transport and economic efficiencies. The software applications special to logistics visualise and organise these mobilities, producing knowledge about the world in transit. Yet for the most part the enterprise resource planning (ERP) software remains a black box for those not directly using these systems as a matter of routine in their daily work across a range of industries, which include but are not limited to logistical industries. Healthcare, medical insurance, education, mining and energy industries along with retail and service sectors also adopt ERP systems to manage organisational activities. One key reason for the scarce critical attention to ERP systems is related to the prohibitive price of obtaining proprietary software, which often costs millions of dollars for companies to implement. The aesthetics of ERP software is also notoriously unattractive and the design is frequently not conducive to ease or pleasure of use. For the digital humanities, this means ERP software analysis is limited to IT services and programmers associated with shipping, warehousing, aviation, rail and road transport industries, and procurement, human resource, inventory and supply chain management.1 As such, logistical software may seem to hold little relevance as an object of study for digital humanities researchers. However, my argument in this chapter is that logistics has a broad social reach and impact in terms of how people undertake work. Logistical software functions as a technology of governance and control, measuring the productivity of labour using real-time key performance indicators (KPIs). Central to logistics is the production of new subjectivities of labour. More than any other aspect of logistical industries, this characteristic of logistics software makes it relevant to researchers in digital humanities. Why? Because such techniques of management are finding their way into academic workplace settings, which are undergoing a transformation into what I would term the logistical university (Rossiter 2010, 2014a). The recent rise of MOOCs (massive open online courses) is a logistical operation that will result in the offshoring and outsourcing of knowledge production. As neoliberal capitalism diversifies its modes of accumulation from the debt economy of housing to the extraction of wealth from student debt and global education markets (Anonymous 2012; Lazzarato 2012; Ross 2009, 2014), logistical critique becomes ever more pressing as a political, social and intellectual undertaking. A focus on logistical media is one line of entry into the development of such a critique. Methods developed within the digital humanities also have an important role to play in the critique of logistical power. Rather than turn to established humanities methods, or even those developed from within the digital humanities proper, this chapter outlines how the process of devising questions and the problem of method coextensive with research on logistics industries lends digital humanities an occasion to reorient both research methods and the production of concepts. The chapter explores such possibilities for digital humanities research with reference to the material dimensions of software systems operative within global logistics industries. Particular focus is given to transport and shipping activities undertaken at Port Botany in Sydney in order to highlight the multiplicity of logistical forces exerted upon labour. The development of a digital visualisation drawing on data from productivity reports of the port is foregrounded to register the relation between design and research practice with regard to the question of method within digital humanities research. While the aesthetic logic of the visualisation is not markedly different from the many visualisations developed in digital humanities, it is nonetheless distinct for the way in which it brings to the fore the practice of method through the process of designing a visualisation. In the case of the Port Botany study, the visualisation served two key purposes: first, as a methodological device in the practice of transdisciplinary research and second, as a media form that made visible the pressures on labour within shipping and transport industries. 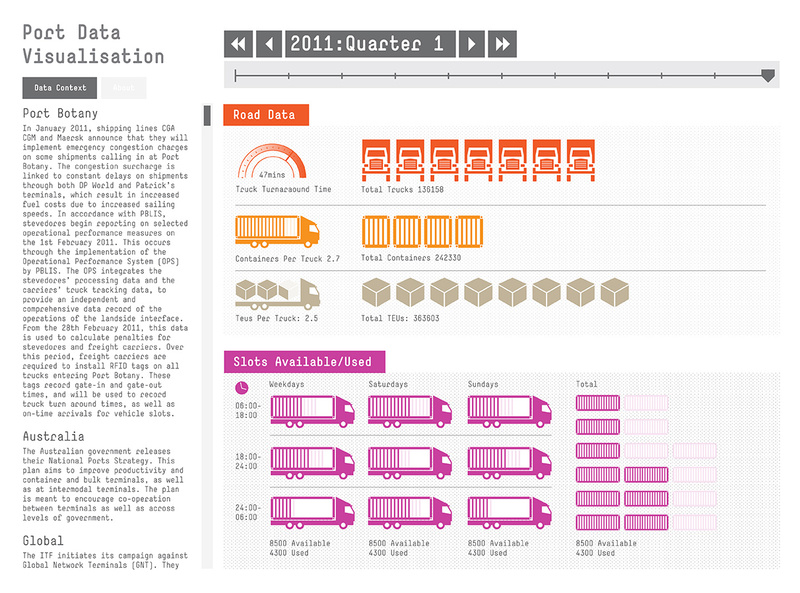 Both aspects of the visualisation enable a critique of logistics, with the visualisation providing a kind of substitute interface in the absence of access to the software actually used in logistical industries. Jangling in the background of this chapter is an interest in developing a theory of logistical media.2 Forecasted in the work on ‘logistical modernities’ by urban theorist and military historian Paul Virilio (2006), and elaborated to some extent in the study on gameplay and war simulations by media philosopher Patrick Crogan (2011), the term ‘logistical media’ is named as such by communication historian and social theorist John Durham Peters (2012, 2013).3 For Peters, the concept of logistical media ‘stresses the infrastructural role of media’ (2012, 43). In addition to storage, transmission and processing systems, I would suggest the larger study of logistical media might also include attention to how the aesthetic qualities peculiar to the banality of spreadsheets, ERP systems and the software applications have arisen from particular histories in military theatres, cybernetics, infrastructural design, transport and communications. Given the elusiveness of logistical software as an object of encounter, this chapter instead shadows such logistical media with recourse to digital visualisations of logistical operations. I emphasise how the digital visualisations are not just a method of aggregating disparate data sets into a new synthetic form that provides insight into conditions of labour; they also work as a mediating apparatus in terms of the sociality and design of research. In other words, the visualisations mediate the relation between people, organisation and things. Finally, I suggest that the visualisations offer digital humanities an opportunity to extend research into the politics of labour as it meets the logistical force of supply chain governance and technologies of control. The digital humanities is a diverse and emerging field that harbours different kinds of innovation and eclecticism. By and large, however, the digital humanities has been notable for its adherence to traditional research objects and rehashing of old methods following the integration of new forms of computational power within institutional settings. Historical literary texts are digitised to revise assumed economic patterns and social forces. Geographers scan topographic maps to produce information layers and digital elevations that reveal new frontiers for research. Google Earth is traversed to uncover obscure archaeological curiosities in a dirt free manner. Even cutting edge research in the field of digital media cultures tends to transpose established humanities and social science methods to conduct ethnographies of Facebook, complex visualisations of networks and content analyses of the Twittersphere. To simply import existing methods (surveys, interviews, questionnaires, focus groups) from the humanities and social sciences and then use digital technology as a technique of enhancement is not really sufficient for the invention of new methods situated within computational architectures (media form). Methods developed from within media of communication – including graphic design and digital visualisation – can assist in understanding, for example, how software architectures operate as key technologies for governing labour within logistical industries. This does not mean producing bar graphs and pie charts using routine applications such as Excel, PowerPoint or Microsoft Word, nor does it involve undertaking geospatial mapping using Google Earth in order to represent the territorial distribution or location of data sets. Likewise, software used in quantitative research such as SPSS that codes questionnaire data for statistical analysis does little to inform research interested in the ways software itself at once shapes and emerges out of material conditions (social relations, economic forces, cultural dynamics). Such methods fit largely in what David Berry (2011) and others have identified as the first wave of digital humanities research, with its focus on the digitisation of archives and artefacts along with developing infrastructure associated with digital repositories and expanding research agendas.4 This wave also involved the scramble for funding that consumes much energy in academics, albeit with a high degree of variation across different national settings. The digital humanities presented humanities academics with the occasion to start scratching at the edges of high stakes funding and infrastructural needs more often commandeered by disciplines in science, technology, engineering and medicine. Another key line of investigation attending Berry’s call for a ‘computational turn’ would include a taxonomy and political economy of software applications and the cultures of code operative within institutional settings across the world. Such an undertaking might begin a critique of the extent to which knowledge production, the management of university routines and their economies are formatted in ways specific to computational regimes of communication. A project of this order is certainly beyond the scope of this current chapter, but I think it nonetheless worth registering as relevant to future research within digital humanities. Needless to say, aspects of such an undertaking are present within this chapter, namely an interest in how economies of code broaden the question of method and production of concepts beyond what is normally assumed of digital humanities research. Cutting edge digital humanities research requires an invention of methods developed through the use of digital media technologies. Methods situated within media of communication – including graphic design, game development and digital visualisation – can assist in understanding how the rules special to ‘algorithmic architectures’ structure the organisation and analysis of data (see Terzidis 2006). Algorithmic architectures are computational systems of governance that hold a variable relation between the mathematical execution of code and an ‘external’ environment defined through arrangements of data (see Parisi 2012). The capacity of algorithmic architectures to organise and analyse data on labour productivity in real-time, for instance, means they function as technologies for governing labour within logistical industries. Moreover, they constitute a key site of intervention for digital humanities research interested in the relation between knowledge, power and computational systems. In order to invent methods that could actually use logistical data in an analytical sense, the development of a video game will be an important component of a current project that tracks Chinese-led globalisation through infrastructure (Rossiter 2014a). Our interest is to identify new regimes of global governance that arise from logistical operations and the coordination of supply chains. Building on earlier collective research undertaken during the Transit Labour project, which I discuss in more detail below, the Logistical Worlds project focuses on the operation of zones, corridors and concessions prompted by logistical industries in Piraeus (Greece), Kolkata (India) and Valparaíso (Chile).6 The video game, provisionally titled Logistical Worlds, extends the premise of digital visualisations as a technique of method by collecting data on labour conditions and logistical operations as the condition of play. Whether this takes the form of scraping publicly available data on port activities or user submission of productivity statistics, for instance, is a matter to be decided. As with the digital visualisation developed in the Transit Labour project, the concept of the game as a method for generating and arranging data for the purpose of critical analysis is a core precept informing the game’s design. The media form of the game also offers the project an idiom of expression through which to produce counter-imaginaries of what anthropologist Anna Tsing (2009) terms ‘supply chain capitalism’ while providing a conceit for data collection through the act of play. The emergent field of digital humanities has sought to develop digital tools such as Geographical Information Systems (GIS), simulation, data-mining and network analysis to assist the humanities and social sciences in an attempt to formulate new research questions and techniques of analysis. More often these tools take the form of software applications able to ‘capture, manage and process’ large data sets, or what computer scientists and industry refer to as ‘big data’ (Manovich 2011). This may include transactional data such as web searches and mobile phone records, along with digital books, newspapers, statistics, photographs, music, interviews and their supporting information architecture of tags, traces, comments. There is a concept-free zeal about the capacity for digital methods to verify some kind of hitherto unobtainable empirical truth.7 In part this stems from a fidelity in the correlation between data, its referent and the material world. In the database economy derived from content management systems, enterprise resource planning (ERP) software and social network media cultures, data has indeed become the new empiric. Displacing earlier analogue methods such as focus groups, phone surveys and questionnaires designed to measure audience taste and consumer behaviours, digitally encoded data has a capacity to scale, recombine and granulate the micro-practices of people, finance and things to which pre-digital methods could only aspire. Needless to say, the frequently assumed empirical dimension of data is better understood in terms of its self-referentiality than its correspondence with an external material world. Once such a claim is accepted, the capacity for data to be modelled in ways that generate what Foucault termed regimes of truth is, at least I find, less objectionable at a theoretical level. This is not to say data is without empirical substance, nor is it to valorise analog objects or offline worlds as imbued with greater materiality or analytical verisimilitude.8 Rather, the emphasis is to acknowledge the role of protocols, standards, norms and parameters special to software platforms and their political economy that define the contours of expression through which data is made intelligible. Moreover, when data is understood to operate within and indeed constitute regimes of truth, a secondary empirical quality emerges in the shaping of social practices and material conditions in ways not so dissimilar from how policies of various kinds result in forms of action. Think of the rhetorical power of climate modelling, which refers to itself as a technical system while impacting on the economic cost, if not the rate, of green house gas emissions. In the process of drawing connections within or across data sets, old or existing research objects are remodelled in new ways. Unsurprisingly, business also has a strong interest in devising new techniques for extracting economic value using tools that produce meaning from the process of data recombination and governance. As a report from The Economist (2010) put it, the proliferation of data ‘makes it possible to do many things that previously could not be done: spot business trends, prevent diseases, combat crime and so on. Managed well, the data can be used to unlock new sources of economic value, provide fresh insights into science and hold governments to account’. That The Economist hitches a neoliberal democratic ethos or agenda to the market potential of data management should come as no surprise. While not especially novel or insightful, The Economist foresees problems with the rise of big data, including data storage availability and privacy and security issues. There may be scope for digital humanities to contribute to these debates in ways that address, for example, cultural and social dimensions wrought by the accumulation of big data. Referring to the absence of canonical figures in the digital humanities compared to those generated within the early years of cultural studies, Andrew Prescott is quite scathing in his characterisation of the field: ‘the focus of much digital humanities work has been on the creation of online projects anchored in conventional subjects’ (2012, 72). While Prescott’s desire for a canon seems to linger as a form of nostalgia for the days when cultural and media studies ‘branch[ed] out into new fields in the way the work of (say) Hoggart did’ (72), it is not something he sees as necessary or even possible for the digital humanities. Indeed, whether the orientation of research in digital humanities, irrespective of its substance, has the capacity to produce canonical works is doubtful. Projects situated within or alongside digital humanities are largely conducted independently of each other as a result of their diverse global and geocultural distribution. As a consequence, a certain disciplinary, institutional and geocultural fragmentation ensues that does not lend itself to the production of disciplinary canons. At the very least, canon formation requires both a distillation and articulation of shared ideas and energies across a broad range of inquiries. One might also debate the need or relevance for a shared theoretical point of reference in order to advance conceptual apparatuses and methodological practices. But this is less Prescott’s point. More urgent for Prescott is the need within digital humanities to give attention to theorizing and critical reflection with reference to digital technologies and objects of research. At the level of disciplinarity, the digital humanities often finds itself set against institutional structures that corral projects into disciplinary silos. In a similar vein, Liu argues that ‘the underlying issue is disciplinary identity not of the digital humanities but of the humanities themselves’ (2013, 410). More straightforwardly, disciplines have disciplinary interests irrespective of whether or not they have undertaken a computational turn. Art historians probe computationally generated patterns in visual archives, linguists develop speech analysis tools, literary scholars build databases to survey the history of book industries, mediaevalists reconstruct the Middle Ages through digital cartographies. As a consequence, new research questions are often posed in terms of how to tackle larger scale data sets rather than address a material world unscored by complex problems. The work on digital methods by sociologist Noortje Marres (2012) is emblematic of such an approach. With an interest in how ‘natively digital’ research tools ‘take advantage of the analytic and empirical capacities that are “embedded in online media”’ (151), Marres’ advocacy of digital methods contrasts with those developed in the digital visualisation of Port Botany discussed below. In focussing on the empirics of data as it is generated through algorithmic operations of search tools such as Issue Crawler, the analysis of political issues, discourses and actors become displaced from the material conditions from which they arise (see Kanngieser, Neilson and Rossiter 2014). As it turns out, ‘method as intervention’ for Marres is a fairly exclusive online undertaking no matter that it might involve a ‘redistribution of research’ and ‘transfer’ of knowledge among diverse actors (see also Rogers 2013). Search data and its visualisation become the universe of critique. The subject of labour is divided between humans and technology in the practice of method but not the interface between politics, economy, subjects and objects, and the material and technical conditions from which they emerge. In the social science and humanities disciplines undertaking transnational and transcultural research using digital methods for collecting and sampling large scale data sets, there is a tendency for analyses to formulate a universal system of questions to ensure maximum consistency in generating usable data. In adopting such methodological and analytical approaches, the disparity between the particularities of the object of study and the abstraction of knowledge becomes even further amplified than might be the case in, for example, more traditional methods of practice in anthropological fieldwork. Alternatively, abstraction itself becomes the object of study, which is the direction taken in Franco Moretti’s quantitative method of ‘distant reading’ of literary history (see Bode 2012, 9). An additional and rarely addressed problem can arise with projects international in scope that place a priority on modelling, visualising, aggregating and analysing large data sets. The underlying method within many ‘global’ approaches to comparative research in media, social and cultural research often seeks to integrate and make uniform data that is non-assimilable due to protocological conflicts, parametric irregularities, qualitative differences and the like. In doing so, such approaches reproduce some of the central assumptions of area studies – namely, that the study of geocultural difference is predicated on equivalent systems of measure that demonstrate difference in terms of self-contained areas or territories and civilizational continuities often conforming to the borders of the nation-state. Yet it is a mistake to suppose that cultural variation can be distinguished in terms of national cultures, at least in any exclusive sense. In the case of transnational research on logistics industries (and, more broadly, any research project taking a global perspective), digital methods of comparative research need to be alert to the asymmetrical composition of data sets on transport and communication industries and labour performance, which upsets any desire for equivalent units consistent across time and space that might provide the basis for comparison. The challenge is not about integrating historical or archival data into ever larger sets but involves working across variable, uneven and often incomplete data sets. Here the fantasy of logistical industries of creating interoperability through protocols of Electronic Data Interchange (EDI) and ERP software platforms hits its limits. Designed to track the movement of people and things, EDI and ERP architectures are intended to function as real-time registrations of labour productivity and the efficiency of distribution systems. Yet these technologies of optimisation frequently rub up against any number of disruptions in the form of labour struggles, infrastructural damage, software glitches, supply chain problems, and so forth. This discrepancy between the calculus of the plan and the world as it happens suggests that the most interesting sites to study are those where interoperability breaks down and methods of organisation external to logistics’ software routines are instituted in an attempt to smooth out the transfer of data and material goods (Neilson 2014). Technologies of logistical governance external to software architectures may include border regimes such as Special Economic Zones (SEZs), territorial concessions and trade corridors. They may also manifest as juridical power in the form of labour laws or extra-state forms of governance such as manufacturing and industrial design standards, communication protocols and the politics of affect as it modulates the diagram or relations special to subjectivity. Borders, in short, proliferate, multiply and at times overlap (Mezzadra and Neilson 2013). Clearly, to study such an expanse of governmental techniques is beyond the scope of this chapter. But the techniques are important to note by way of signalling the digital is not as ubiquitous as often claimed or assumed. And this has implications for the design of methods within digital humanities, chief among these is an ‘invention of new knowledge practices and methods that intervene in the world’ (Neilson 2014). A study of logistical media begins to address some of these issues. With its attention to flexibility, contingency, control and coordination, logistical media critique opens the relation between economies of data and the remodelling of labour and life. In terms of disciplinary orientation, logistical media theory does not yet exist. It is a theory whose status has yet to coalesce into a sustained analytical and methodological body of research and knowledge. For the purpose of sketching some contours of influence, I would suggest that logistical media theory is informed by the fields of network cultures, software studies, critical organisation studies, Canadian communications research and German media theory in addition to anthropological and historical research on infrastructure. Given the focus on digital methods in this chapter, I will limit my comments here to the relation between logistical media critique and software studies. The program of ‘cultural analytics’, headed by Lev Manovich (2011a) and his Software Studies Initiative at the University of California – San Diego, summarises its project in ways that essentially transpose already existing techniques rather than invent new methods per se: ‘Today sciences, business, governments and other agencies rely on computer-based analysis and visualization of large data sets and data flows. They employ statistical data analysis, data mining, information visualization, scientific visualization, visual analytics, and simulation. We propose to begin systematically applying these techniques to contemporary cultural data’ (Manovich 2011b, 2013). By contrast, a study of software within the global logistics industries prompts the question of method with regard to how to research the relation between software and the management of labour, the role of logistics infrastructure and the reconfiguration of urban, rural and geopolitical spaces, and the production of new regimes of knowledge within an organisational paradigm. Software systems operative within global logistics industries such as SAP or Oracle generate protocols and standards that shape social, economic and cross-institutional relations within and beyond the global logistics industries. How such governing forces and material conditions are captured and made intelligible through the use of digitally modified data is, in part, the challenge of method. Forms of pattern recognition beyond the basic data hold relevance for how the emergent paradigms of digital humanities and software studies analyse the massive volume of big data generated by digital transactions and user-consumer practices online. Big data analysis of habits of consumption is interesting for commercial entities, but not particularly exciting for social and political analysis of network ecologies. How to ascertain a relation between data, materiality and subjectivity is a problem little addressed by either digital humanities or software studies.10 What would the critical practice of digital humanities research consist of in the study of big data? How might such practices be designed on transnational scales involving networks of collaborative constitution? What are some of the particular problems surrounding the politics of depletion that come to bear both in the method of digital humanities research and the data sets under scrutiny? Where is the dirt that unravels the pretence of smooth-world systems so common within industry, IT and state discourses around global economies and their supply chains? And can disruption be understood as a political tension and form of conflictual constitution? Within cybernetics ‘noise’ is a force of ambivalence, interference and disruption, refusing easy incorporation within prevailing regimes of measure. Constituent forms of subjectivity and the ontology of things often subsist as noise. Undetected, without identity and seemingly beyond control, noise is the ‘difference which makes a difference’ (Bateson 1972). Digital humanities research would do well to diagram the relations of force and transformation operative within ecologies of noise populated by unruly subjects, persistent objects and algorithmic cultures. A form of critique is required that is not simply an extension of classical political economy into the realm of digital labour, as exemplified by the work of Christian Fuchs (2008, 2014). Logistical media theory is one possible alternative that brings method and critique together in ways sufficient to the task of examining how algorithmic capitalism shapes the experience and condition of labour. In elaborating digital methods developed out of logistical operations, I refer to the Transit Labour project, which examined how circuits of labour are reshaping the contours of regions while coming up against, testing and transforming a multiplicity of borders.11 Our work around digital methods builds upon international research we have been conducting on labour, logistics and the production of subjectivity in Shanghai, Kolkata and Sydney. After an initial interest in labour in the cultural industries, we quickly realised how labour mobilities that condition the possibility of cultural labour cannot be reduced to the cultural sector alone. Indeed, we found that logistics is key to forms of ‘differential inclusion’ such as SEZs, land acquisition policies, residential permits, software protocols and manufacturing standards (see Mezzadra and Neilson 2013). Along with cultural and social borders, these kind of devices or apparatuses that modulate inclusion and movement within logistical industries also function to govern labour and supply chains in the informational economies. The political challenge for research on logistics is to devise techniques and strategies that operate both within and outside the territory of control exerted by logistics technologies and their software algorithms. I emphasise the need for politically inflected research here for the obvious reason that technology and software shape how practices of knowledge production are organised and how labour is governed. And I register such research as a challenge due to the difficulty, among others, of producing – let alone even identifying – counter-logistical worlds. Needless to say, a start can be made. The study of how databases, supply chain software, GPS, Voice Picking and RFID technologies affect work in the logistics industries contributes to a politicised conception of humanities and social research (see Kanngieser 2013). Furthermore, the incorporation of digital methods into critical research on logistics can facilitate and inform the politics of data, which I would suggest is also a politics of labour and life, borders and movement, knowledge production and infrastructural implementation. Relevant here for the development of digital methods is the question of how labour performativity is incorporated into the computational design of visualisations as distinct from decision making undertaken by machines. Given that the body of labour is at the centre of logistical calculations of productivity and efficiency, it is also the least visible for those not directly working within logistical industries or involved in developing and implementing parameters for supply chain software. Thus one of the key reasons why a critical study of logistics is going to devise quite different computational and design methods than, say, Manovich’s program on cultural analytics has to do with the difficulty of obtaining data sets due to confidentiality agreements along with the politically sensitive nature of some of this data. Statistics on labour productivity are especially protected across the institutional spectrum in the case of Australia’s ports, which have been marked by industrial dispute between the MUA (Maritime Union of Australia) and stevedoring companies over the past year (to say nothing of the long history of dispute). In the formal, high-end sectors of the logistics industries, it is particularly difficult to research the actual software used to oversee supply chains and measure labour performativity in real-time. One reason for this has to do with prohibitively expensive proprietary licenses that enclose the computational operations of logistical firms coupled with the highly guarded ways in which companies and authorities regulate access to this software and the data it generates. As a result, other processes and techniques of computational research are required in order to model logistical worlds, foregrounding the labour dimension of ‘supply chain capitalism’. Based on publicly available data sets published in Waterline reports from the Australian government’s Department of Infrastructure and Transport, the pilot study we conducted on logistics operations at Port Botany in Sydney aimed to digitally visualise the relations between container loading / unloading times, truck turn-around times and the pressures that come to bear upon labour productivity and efficiency.12 These government reports provide statistics on a set of parameters designed to measure wharf-side productivity (loading and unloading of containers) and land-side performance (truck turn-around times upon entering and exiting the port). The report’s statistics are compiled from data supplied by port authorities (Sydney Ports) and stevedoring companies (DP World, Patricks) operating around the country. While the reports provide a range of productivity indicators, they do not provide data on labour performance even though they indicate that ‘elapsed labour time’ was one of the measures used to calculate the vessel working rate (or number of containers handled per hour). Sydney Ports and the Department of Planning and Infrastructure have been unable to provide us with figures on labour performance and we are looking into other possible organisations such as transport unions that might open these data sets for our analysis. Container loading and unloading times, and indeed truck turn-around times, can therefore be read as a substitute for labour productivity (Fig. 1). It is no surprise that the genre of the reports is unable to register the various tensions that underlie performance measures that seek to smooth over glitches between the movement of trucks throughout the port area and the unloading of containers from ships (Hepworth 2013). Port authorities attempt to regulate traffic problems landside through the use of RFID vehicle tracking and online ‘vehicle booking slots’ (VBS), which determine when a truck enters the port and the time it has to be serviced by the stevedore and exit without incurring penalty. Introduced at Port Botany in 1999, Katie Hepworth (2013) notes that ‘the VBS became the site of intervention by the ports authority into the operations of its leaseholders, DP World and Patrick Stevedores; the slot became the means of reorganising the operators’ relationships with various terminal users’. Yet it also resulted in conflicts between data systems through governance methods quite different from data transaction protocols (EDI, ERP, etc.). Extra booking slots would be made available online for trucks during periods when the port was less busy, for example, or warehouses able to receive goods may not be operating while containers are being loaded on the wharf. Traffic congestion across the urban road network intervenes as another contingency unable to be accommodated within the circumscribed universe of the vehicle slot booking system. Time and space, in other words, upset interoperability in multiple ways. Figure 1. 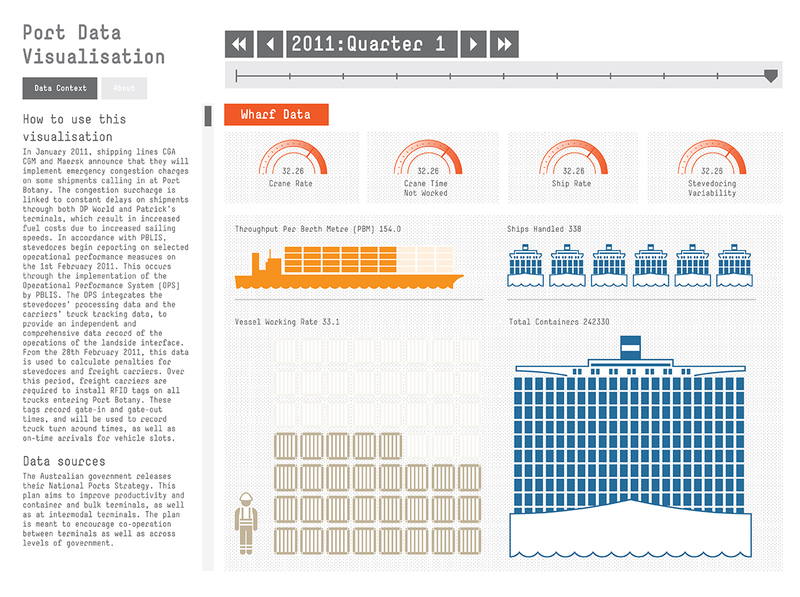 Port Botany Wharf Data Visualisation, http://transitlabour.asia/documentation/. Design: Kernow Craig, research: Katie Hepworth, visual analytics programming: Quang Vinh Nyugen, concept: Brett Neilson and Ned Rossiter. Through the more traditional humanities and social science method of conducting interviews and site research, the Port Botany research identified data sources usually not subject to critical digital humanities analysis. Much data on logistics industries is frequently not publicly accessible on websites. The Port Botany project showed that data sets often only become known about in the instance of discussion with informants. Data on the impact of technology on labour practices and conditions, for example, is something many unions collect for the purpose of internal analysis. And typical of more anthropological modes of investigation, we found that unions are willing to make that data available to university researchers once a relation of trust has been established. Along with productivity figures obtained from publicly accessible government and industry reports, such data on workplace productivity can then serve as analytical parameters in the digital visualisations of logistical operations. A recent technology report noted that ‘data must be broken out of silos in order to be mined, and the organization must learn how to communicate and interpret the results of analysis’ (Dumbill 2012). With most high-end logistical software systems only available through prohibitively expensive proprietary licenses, the Port Botany project sought to remodel publicly and commercially available data sets as digital visualisations that assist in the analysis of logistics, infrastructure and labour. In this respect, a key outcome of this study involved understanding that ‘The art and practice of visualizing data is becoming ever more important in bridging the human-computer gap to mediate analytical insight in a meaningful way’ (Dumbill 2012). The central analytical framework for designing and interpreting the digital visualisations consists of translating the data (e.g. on labour productivity, container movements, truck turnaround times in ports, supply chain volumes, etc.) with a view to understanding how the combination of infrastructure and algorithmic architectures function as technologies that govern logistical labour. The digital visualisations effect their own algorithmic architecture (or rules of code) distinct from those available through proprietary licenses. Obviously the visualisations are not software applications that coordinate supply chains; rather, the digital visualisations begin to offer an analytical medium through which to register the inter-relations between logistical infrastructure, algorithmic rules, labour practices and supply chain assemblages. To be clear, the animated digital visualisations that the Transit Labour project developed in collaboration with colleagues in computer science and design do not profess to represent in any veridical manner the conditions and experiences of labour. Nor do they assume to be particularly innovative at the level of design, method or concept when compared to other visualisations of temporality in digital humanities projects. Rather, the visualisations make a claim for research on the politics of labour within the field of digital humanities. Again, such research can be distinguished from work done on virtual or digital labour which, like the digital sociology of Marres and others, takes the online world as its milieu of action at the expense of studying how online worlds or digital apparatuses and the methods we bring to them are entangled with material conditions of possibility. In contrast to such approaches, the visualisations indicate a diagram of relations special to logistical operations at Port Botany and, more generally, to logistical worlds. Simple as it may seem, to chart a ten year period of truck turn-around times and loading and unloading times at Port Botany begins to make visible some of the forces around labour productivity (Fig. 2). Moreover, the visualisation begins to suggest that logistics is substantially removed from the all pervasive smooth world fantasy upheld by industry, government and the IT sector in which complex operations move across a seamless continuum of control and order. Logistical operations are better understood as event processes underscored by conflict, dispute, glitches and contingency. Here, we can think about the waterfront disputes heating up in Australia and New Zealand, where labour flexibility and demands for increasing productivity are key issues in concert with managerial drives for enhanced automation technologies. An announcement by Patrick in 2012 explains that the 44 AutoStrads (automated straddles not requiring human operation) ordered for delivery at Port Botany in 2013-2014 ‘will operate unmanned, using radar and laser guidance technology to navigate the straddles around the yard, moving and stacking containers from the quay line into the holding yards, onto vehicles and back to the quay cranes with pinpoint accuracy of better than 2cm’ (Patrick 2012). Automation thus presents an index of industrial dispute as maritime labour confronts stevedores such as Patrick (whose container ports were acquired by Asciano in 2007 following a restructure of Toll Holdings), DP World and Hutchinson, which are all set to increase productivity rates across the country’s container terminals through unmanned straddle carriers. While efficiency gains are the prime motivation behind such technological upgrading, an obvious cost occurs in terms of labour redundancies. Labour on Sydney’s ports, in short, is set to be transformed in terms of new modes of work following the introduction of automation. Another example of the centrality of labour to logistics can be drawn from Occupy Oakland, which concentrated on port blockades in an attempt to disrupt global supply chains of capital accumulation.13 As with many disputes, there are frequently internal lines of division. In this case, the tactic of port blockades ran afoul of local unions and at least some of their members, who claimed that the occupation resulted in workers and their families suffering economic hardship due to loss of income. We could also see this as an interesting contest over the right to intervene by different organisational forms. Back to the national setting in Australia: the 1988 waterfront dispute was the iconic strike of the Howard era government and took a defining toll across many other areas of labour in Australia, shaping the form of the current resource driven economy (fly-in-fly-out workers, off-shoring of labour within both the mining industry and more recently across a range of service industries on the Eastern seaboard of the country). The remarkable thing about logistics is its capacity to incorporate these sorts of disruptions within ever expanding parameters through the rubric of ‘fault tolerance’. This means that while labour struggles, infrastructural breakdowns, supply chain blockages, natural disasters and so forth may have significant effects, they also prompt logistics to reorient shipping routes, relocate warehouses and factories, search for economic zones with more favourable labour regulations and better tax incentives, and so on. Contingency, in short, conditions the reproduction of logistics.14 This flexible dynamic of absorbing disturbances to produce new regimes of coordination and control lends a high degree of temporariness and partiality to attempts to diagram logistical relations through the design of visualisations. The digital visualisations produced in the Transit Labour project point to the undulations and irregularities of seemingly mechanical functions that can be better understood when situated in broader economic and political contexts that encompass local, national, regional and global scales. The transdisciplinary practice of collectively producing the visualisations corresponds with Willard McCarty’s notion of the ‘model’ and ‘modelling’, which he understands as ‘the process seen in and by means of a developing product, not the definitive achievement’ (2005, 22). At the level of method, Transit Labour’s visualisations operate as models by feeding back into a research process and constellation of practices, prompting a revision of research questions and pointing to institutional settings and relevant experts for follow up engagements that may well take the form of more traditional humanities research methods such as interviews and site visits. The visualisations also signal that data aesthetics has a central role to play in devising suitable methods for research projects that cut across the otherwise smooth relation assumed between labour, software, infrastructure and economic growth. Data aesthetics bring critique together with design in the invention of method. Or as Liu writes, ‘Seeing design in data is a method for knowing meaning in the digital humanities’ (2013, 216). At stake, I would suggest, is not only the development of novel methods shaped by the social-technical dynamics of digital media, but the constitution of subjectivity itself. Since software and technology are transforming how we do work, there is an opportunity here to alter the parameters and thus topological horizons of machine intelligence and its increasing governance of labour and life. Digital humanities is in danger of becoming stuck at the level of the digitalisation of existing archive material, producing visualisations of these and other so-called big data. By shifting the object of research beyond traditional areas of study (literary archives, data sets of artworks and museum collections, etc. ), digital humanities research becomes relevant to broader social and political concerns that place great emphasis upon economic activities and associated infrastructure. Digital methods can address political issues and the routines and institutions that sit between people and states, labour and capital, borders and subjectivity. Digital humanities research at the current conjuncture might decide to investigate how circuits of capital connect with the constituent force of labour, life and things, shaping the production of time, space and economy in variational ways. With an interest in making visible the new subjectivities of logistics and the politics of parameters, I have positioned research on logistical media and ‘supply chain capitalism’ within the digital humanities, not the social sciences. In the age of big data everything and anything is or has the capacity to become digitally encoded. Data sets are everywhere, residing as a standing-reserve awaiting incorporation as topological parameters into analytical models and capital expropriation. As Paul Edwards notes, ‘Parameterization illustrates the interaction of computational friction with the limits of human knowledge’ (2010, 338). Within a topological horizon, the politics of parameters amounts to a battle around epistemological and social legitimacy in the form of measure. Parameters are also a matter of protocols, which Alexander Galloway understands as ‘the technology of organization and control operating in distributed networks’ (2006, 317). Parameters and protocols are both rules that govern systems. If a person, thing or phenomena is without rule or measure it might just as well not exist. In assembling data sets selection is predicated on the poverty of excess, which is data gone to waste. This, at least, is the doxa of a logistical world view where everything is about accountability, efficiency and productivity calibrated in systems of real-time. Data produces and is accompanied by other forms of waste, forms more insidious than the economist’s ‘wasted opportunity’. The social production of value and the algorithmic mining of data seem the last frontiers of economic extraction. But so often we’re talking about a social milieu and informational economy that is profoundly abstracted from the multiple informal economies and geocultural settings engaged in secondary forms of value extraction. A substantial portion of the latter are associated with economies of electronic waste, with the Global South structurally and historically consigned the role of manufacturing and later dispersion of discarded ICTs and consumer electronics. Both the production and dismantling of e-waste exposes ‘workers and ecosystems to a morass of toxic components’ (Maxwell and Miller 2012, 3). With Internet transmissions long ago exceeding measure, and annual increments in computational power ensuring planned obsolescence, analytical capacity and consumer desire both become destined to their own forms of obsolescence. Jennifer Gabrys: ‘Obsolescence is not so much innovation in reverse as it is the ongoing maintenance of a sense of technological development’ (2011, 116). On the sidelines of speed, digital humanities research might seem left pondering the disaster as a program beyond control. * Chapter forthcoming in Paul Arthur and Katherine Bode (eds), Advancing Digital Humanities: Research, Theory, Methods, Palgrave Macmillan, 2014. I would like to thank Katherine Bode, Mark Coté, Alan Liu and Brett Neilson for their suggestions for revision and comments on an earlier draft of this paper. Anonymous. The Debt Resistors’ Operations Manual. A Project of Strike Debt / Occupy Wall Street, New York, September 2012. http://www.scribd.com/doc/105740740/The-Debt-Resistors-Operations-Manual. Balsamo, Anne. Designing Culture: The Technological Imagination at Work. Durham: Duke University Press, 2011. Berry, David M. ‘The Computational Turn: Thinking about the Digital Humanities.’ Culture Machine, 12 (2011): 1-22, http://culturemachine.net. Berry, David M., ed. Understanding the Digital Humanities. Basingstoke and New York: Palgrave Macmillan, 2012.
boyd, danah and Kate Crawford. ‘Critical Questions for Big Data: Provocations for a Cultural, Technological, and Scholarly Phenomenon.’ Information, Communication & Society 15, no. 5 (2012): 662-79. Bratton, Benjamin H. ‘Logistics of Habitable Circulation’. In Paul Virilio, Speed and Politics, translated by Marc Polizzotti, 7-25. Los Angeles: Semiotext(e), 2006. Burdick, Anne, Johanna Drucker, Peter Lunenfeld, Todd Presner and Jeffrey Schnapp. Digital_Humanities. Cambridge, Mass. : MIT Press, 2012. Carr, Nicholas. The Shallows: What the Internet is doing to our Brains. New York: W. W. Norton, 2010. Craig, Hugh and Arthur F. Kinney, eds. Shakespeare, Computers and the Mystery of Authorship. Cambridge: Cambridge University Press, 2009. Crogan, Patrick. Gameplay Mode: War, Simulation and Technoculture. Minneapolis: University of Minnesota Press, 2011. Deuze, Mark. Media Work. Cambridge: Polity, 2007. The Economist. ‘Data, Data Everywhere (interview with Kenneth Cukier).’ 25 February 2010. http://www.economist.com/node/15557443. Dumbill, Edd. ‘What is Big Data? An Introduction to the Big Data Landscape.’ O’Reilly Radar, 19 January 2012. Edwards, Paul N. A Vast Machine: Computer Models, Climate Data, and the Politics of Global Warming. Cambridge, Mass. : MIT Press, 2010. Evans, Leighton and Sian Rees. ‘An Interpretation of Digital Humanities.’ In Understanding the Digital Humanities, edited by David M. Berry, 21-41. Basingstoke and New York: Palgrave Macmillan, 2012. Fuchs, Christian. Internet and Society: Social Theory in the Information Age. New York: Routledge, 2008. Fuchs, Christian. Digital Labour and Karl Marx. New York: Routledge, 2014. Galloway, Alexander R. ‘Protocol.’ Theory, Culture & Society 23, nos. 2-3 (2006): 317-20. Golumbia, David. The Cultural Logic of Computation. Cambridge, Mass. : Harvard University Press, 2009. Greenfield, Susan. ID: The Quest for Identity in the 21st Century. London: Sceptre, 2008. Hepworth, Katie. ‘Enacting Logistical Geographies.’ Unpublished paper, 2013. Hesmondhalgh, David and Sarah Baker. Creative Labour: Media Work in Three Cultural Industries. Oxon: Routledge, 2011. Kanngieser, Anja. ‘Tracking and Tracing: Geographies of Logistical Governance and Labouring Bodies.’ Environment and Planning D: Society and Space 31, no. 4 (2013): 594-610. Kanngieser, Anja, Brett Neilson and Ned Rossiter. ‘What is a Research Platform? Mapping Methods, Mobilities and Subjectivities’. Media, Culture & Society (forthcoming 2014). Kirschenbaum, Matthew G. Mechanisms: New Media and the Forensic Imagination. Cambridge, Mass. : MIT Press, 2008. Lazzarato, Maurizio. The Making of Indebted Man: An Essay on the Neoliberal Condition, translated by Joshua David Jordan. Los Angeles: Semiotext(e), 2012. Liu, Alan. ‘The State of the Digital Humanities: A Report and a Critique.’ Arts & Humanities in Higher Education 11, nos. 1-2 (2012): 8-41. Liu, Alan. ‘The Meaning of the Digital Humanities.’ PMLA 126, no. 2 (2013): 409-23. Logistical Worlds: Infrastructure, Software, Labour, http://logisticalworlds.org. Lovink, Geert. ‘MyBrain.net: The Colonization of Real-Time and other Trends in Web2.0.’ Eurozine, 18 April 2010. McCarty, Willard. Humanities Computing. Basingstoke: Palgrave Macmillan, 2005. McCarty, Willard. ‘Knowing: Modeling in Literary Studies.’ In A Companion to Digital Literary Studies, edited by Susan Schreibman and Ray Siemens. Oxford: Blackwell, 2008. http://www.digitalhumanities.org/companionDLS/. Manovich, Lev. ‘Trending: The Promises and the Challenges of Big Social Data.’ 2011a. http://www.manovich.net/DOCS/Manovich_trending_paper.pdf. Manovich, Lev. ‘Cultural Analytics: Visualizing Cultural Patterns in the Era of “More Media”.’ 2011b. http://manovich.net. Marres, Noortje. ‘The Redistribution of Methods: On Intervention in Digital Social Research Broadly Conceived.’ The Sociological Review 60 (2012): 139-65. Maxwell, Richard and Toby Miller. Greening the Media. New York: Oxford University Press, 2012. Mezzadra, Sandro and Brett Neilson. Border as Method, or, the Multiplication of Labor. Durham: Duke University Press, 2013. Mirowski, Philip. Never Let a Serious Crisis Go to Waste: How Neoliberalism Survived the Financial Meltdown. London and New York: Verso, 2013. Munster, Anna. An Aesthesia of Networks: Conjunctive Experience in Art and Technology. Cambridge, Mass. : MIT Press, 2013. Culture Unbound: Journal of Current Cultural Research 6 (forthcoming 2014). Patrick. ‘Asciano Signs Contract for Automated Straddles for Port Botany.’ 3 September 2012. Parisi, Luciana. ‘Algorithmic Architecture.’ In Depletion Design: A Glossary of Network Ecologies, edited by Carolin Wiedemann and Soenke Zehle, 7-10. Amsterdam: XMLab and the Institute for Network Cultures, 2012. Peters, John Durham with Jeremy Packer. ‘Becoming Mollusk: A Conversation with John Durham Peters about Media, Materiality and Matters of History.’ In Communication Matters: Materialist Approaches to Media, Mobility and Networks, edited by Jeremy Packer and Stephen B. Crofts Wiley, 35-50. New York: Routledge, 2012. Peters, John Durham. ‘Calendar, Clock, Tower.’ In Deus in Machina: Religion, Technology and the Things in Between, edited by Jeremy Stolow, 25-42. New York: Fordham University Press, 2013. Prescott, Andrew. ‘Consumers, Creators or Commentators? Problems of Audience and Mission in the Digital Humanities.’ Arts & Humanities in Higher Education 11, nos. 1-2 (2012): 61-75. Rogers, Richard. Digital Methods. Cambridge, Mass. : MIT Press, 2013. Ross, Andrew. ‘The Rise of the Global University.’ In Nice Work If You can Get It: Life and Labor in Precarious Times. New York: New York University Press, 2009, 189-205. Ross, Andrew. Creditocracy and the Case for Debt Refusal. New York: OR Books, 2014. Rossiter, Ned. ‘The Informational University, the Uneven Distribution of Expertise and the Racialisation of Labour’, Edu-Factory Journal Zero Issue (January 2010). http://www.edu-factory.org/edu15/webjournal/n0/Rossiter.pdf. Rossiter, Ned. ‘Logistical Worlds.’ Cultural Studies Review 20, no. 1 (forthcoming 2014a). Rossiter, Ned. ‘Locative Media as Logistical Media: Situating Infrastructure and the Governance of Labor in Supply-Chain Capitalism.’ In Locative Media, edited by Gerard Goggin and Rowan Wilken. New York: Routledge, forthcoming 2014b. Terzidis, Kostas. Algorithmic Architecture. Oxford: Architectural Press, 2006. Tsing, Anna. ‘Supply Chains and the Human Condition.’ Rethinking Marxism 21, no. 2 (2009): 148-76. Scholz, Trebor, ed. Digital Labor: The Internet as Playground and Factory. New York: Routledge, 2013. Schnapp, Jeffrey and Todd Presner. ‘The Digital Humanities Manifesto 2.0.’ 2009. http://www.humanitiesblast.com/manifesto/Manifesto_V2.pdf. Virilio, Paul. Speed and Politics, translated by Marc Polizzotti, 7-25. Los Angeles: Semiotext(e), 2006. Comments closed — Trackback URI RSS 2.0 feed for these comments This entry (permalink) was posted on Thursday, February 13, 2014, at 9:34 pm by Ned Rossiter. Filed in Logistics and tagged digital humanities, logistical media theory.